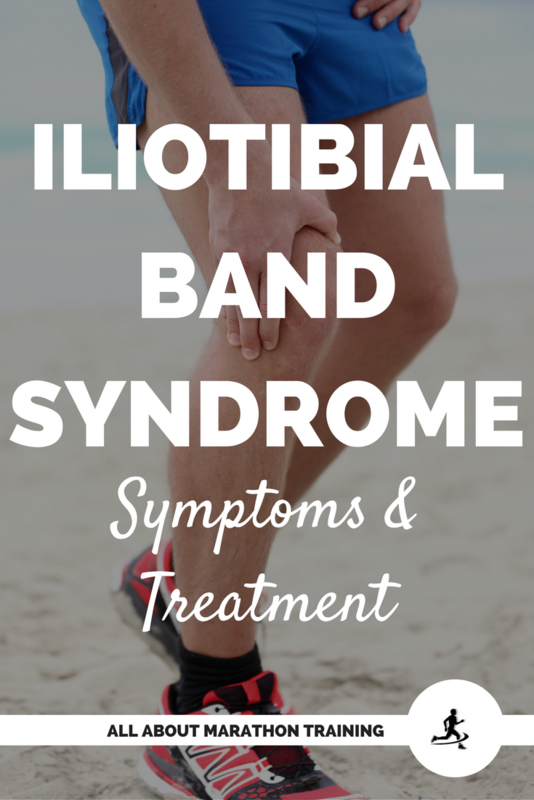 Iliotibial Band Syndrome is sometimes generally referred to as "Runner's Knee". 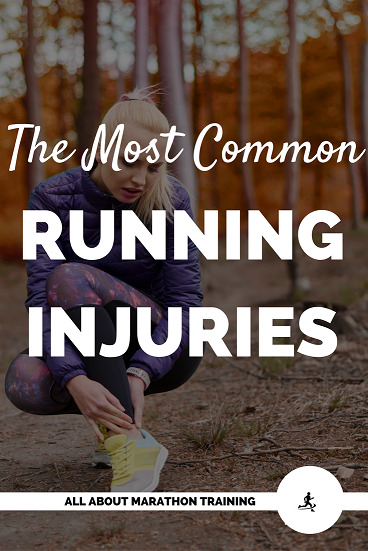 It is a common overuse injury that is experienced in many repetitive movement sports such as running. 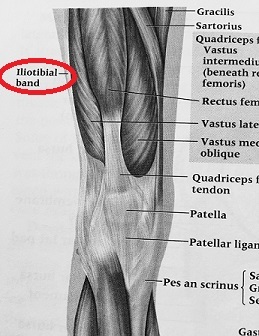 The iliotibial band extends from the gluteus muscles (buttocks) to the outside edge of the patella and knee bones. The band serves as a stabilizing mechanism to the outside of the hip bone and to prevent internal knee rotation during each running step that you take. 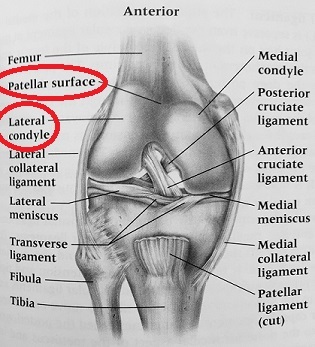 Taken from "Arnheim's Principles of Athletic Training"
Research, up until recently, has described iliotibial band syndrome as friction that develops by the band rubbing over the lateral femoral condyle of the knee bone. This rubbing causes pain with each step that you take. However, more recently, exercise scientists have been redefining this description as a thickening of the fascia lata of the thigh muscles which becomes compressed during your step gait while running. When the fascia lata (tissue) becomes thicker, it becomes tighter and causes pain. The most common treatments are: REST, NSAID usage (non-steroidal anti-inflammatory drugs) and physical therapy. Your best course of action is to be diagnosed by your doctor, who will probably use the Ober or Renee test to diagnose, and be recommended a treatment program through him. Try to use a midfoot strike. If you are a heelstriker you are placing an incredible amount of force on your knee each time you hit the ground. Changing your footstrike requires practice but in general if you are trying to "baby" a bad knee you will naturally tend to midfoot or plantar strike the ground. Lean forward slightly (don't overdo it!) while you run so that on impact with the ground you will land closer to your center of mass which will reduce the forces felt at the knee. Run on flat, level surfaces to keep the knee angle constant and larger than the angle at which friction and the pain that ITBS brings can occur. To find out how your step rate, have a friend video you running for one minute. Simply count how many steps you take during that minute and then multiply by 0.05-0.10. The answer will tell you how many steps you should be taking per minute in order to improve your running mechanics. As mentioned previously, this may take a lot of re-training since you already have a natural cadence. It might be helpful to invest in a Gymboss Classic Interval Timer to beep at you every minute while counting your steps. 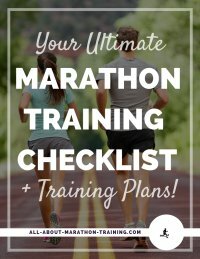 If you choose to run on the treadmill, which is probably the best choice when first starting, set a metronome that helps you set your step cadence. You can find free metronome clocks online and set it to your steps per minute rate. Many of those who develop ITBS have genu varum (bow legs) and pronated feet. Therefore one way to prevent the syndrome is by making sure your running shoes work against your pronation. Get your shoes fitted by a professional or someone who can analyze your running footsteps. Employ a mid-foot strike and lean slightly forward. This will cause you to place less force on the knee when you impact the ground. It also allows you to step almost right on your center of mass. Heel striking is the worst footstrike to use when experiencing ITBS as it places almost all the stress on the knee joint. When Can You Run Again? It is as always, best to ease into running. 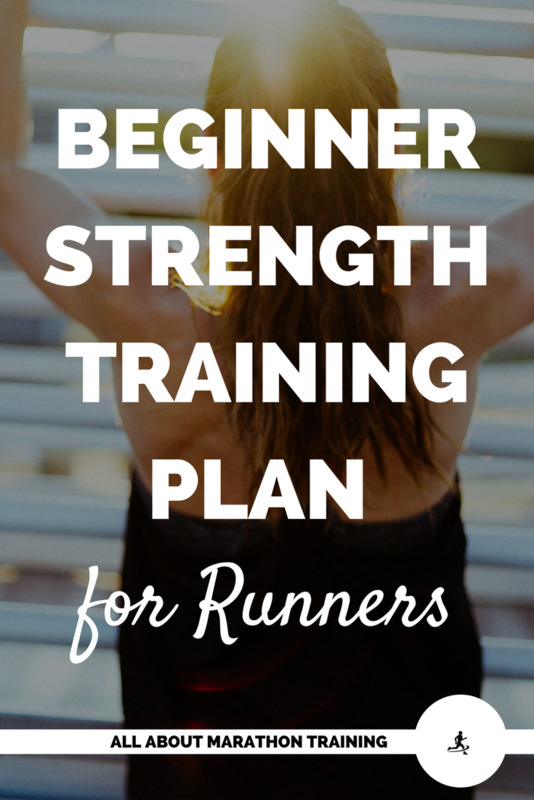 Start with 1-2 miles/day, 3 days out of the week. Keep one day of rest between each running day. 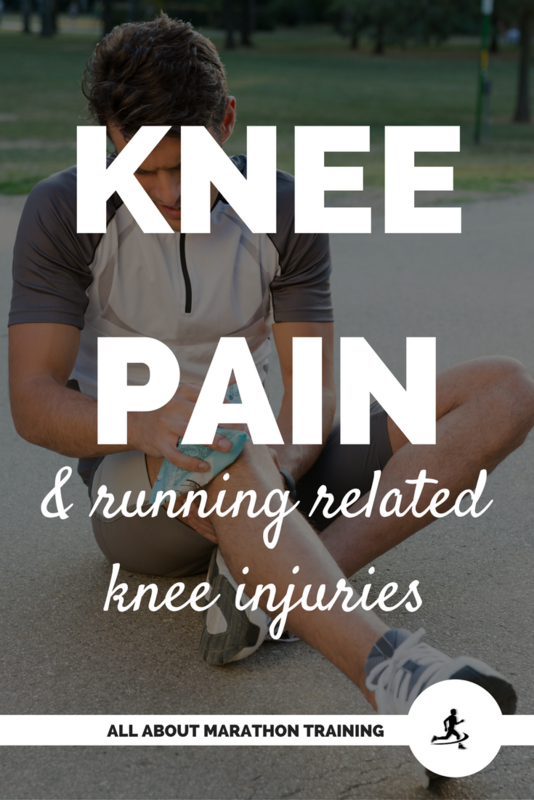 Stop running if you feel pain. 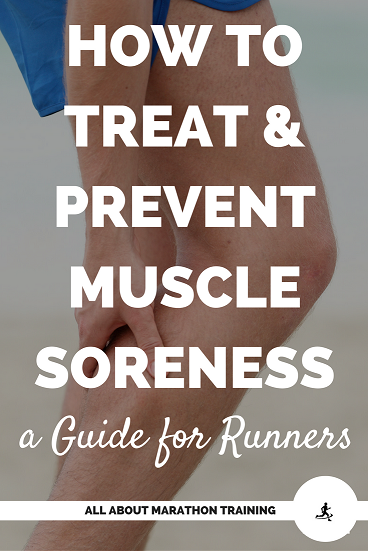 If you are pain free, increase your mileage by 5-10% the next week. As always, follow the advice of your health care provider. Rehabilitating ITBS can be a very long process and it is best to go extremely slow and to barely increase your mileage with each week but it is worth the effort to get your body back to set point. For one of these exercises you will need a white Ethafoam Roller. A lot of hip strengthening exercises employ the use of a Thera-Band so it is a great idea to add it to your running strengthening collection. Allen DJ. Treatment of distal iliotibial band syndrome in a long distance runner with gait re-training emphasizing step rate manipulation. Int J Sports Phys Ther. 2014 Apr;9(2):222-31. PubMed PMID: 24790783; PubMed Central PMCID: PMC4004127. Cowden CH 3rd, Barber FA. Arthroscopic treatment of iliotibial band syndrome. Arthrosc Tech. 2013 Dec 19;3(1):e57-60. doi: 10.1016/j.eats.2013.08.015. eCollection 2014 Feb. PubMed PMID: 24843846; PubMed Central PMCID: PMC4017954. Orchard JW, Fricker PA, Abud AT, Mason BR. Biomechanics of iliotibial band friction syndrome in runners. Am J Sports Med. 1996 May-Jun;24(3):375-9. Review. PubMed PMID: 8734891. Phinyomark A, Osis S, Hettinga BA, Leigh R, Ferber R. Gender differences in gait kinematics in runners with iliotibial band syndrome. Scand J Med Sci Sports. 2015 Jan 26. doi: 10.1111/sms.12394.